Reproduction. WW2 Style. 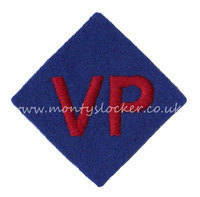 Cotton armband with machine stitched on wool cloth lettering. Manufactured by Monty's Locker. Regimental Police Armband. Normally worn with the regimental cap badge in between the lettering. Space is left for you to include your own regimental cap badge (Not included). Please choose which period you require from the drop down box below. Version shown above is pre 1940.